Have you ever dreamt of flying over the most beautiful areas of Tenerife Island? Do you wonder how does it feel when you are up in the air? The answer is absolute freedom! If these questions have made you feel excited, you have just found your next adventure in the Canary Islands — a paragliding tandem flight in Tenerife South. There are no words to describe this feeling, you need to come and try this paragliding experience in Tenerife South. If you do it, you will never regret it — what’s more, you will talk about it for ages. At Overfly Tenerife we offer you the perfect combination of excitement and astonishing beauty. So, what we offer you is the chance to enjoy an incomparable trip that fulfills one of the biggest people’s dreams — the chance of flying. We offer you a paragliding tandem flight in Tenerife South, which will provide you a different point of view of the island. See all nature and the ocean from 700 or 1.000 meters above the ground, you can choose the experience you like the most. 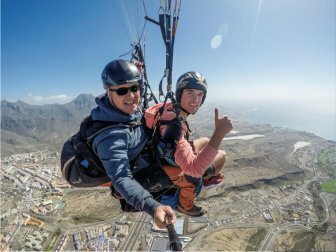 If you were looking for another reason to choose Tenerife as your next holiday destination, bear in mind that paragliding tandem flight in Tenerife South could be the perfect excuse. Check out our paragliding services and don’t hesitate to contact us whenever you are ready to live this marvelous paragliding experience in Tenerife South. 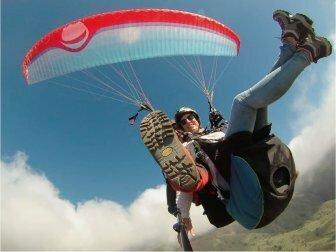 WHY SHOULD YOU CHOOSE A PARAGLIDING TANDEM FLIGHT IN TENERIFE SOUTH? You just have to smile, disconnect and enjoy the experience of flying like a bird, a dream that can come true. The views are stunning. Get started with our most popular experience, a tandem flight over Tenerife South. We recommend you to wear comfortable clothes and sportive footwear. Furthermore, it is necessary to count on basic and suitable equipment to live this unique sport. From Overfly Tenerife we will provide you with all the equipment that you need. 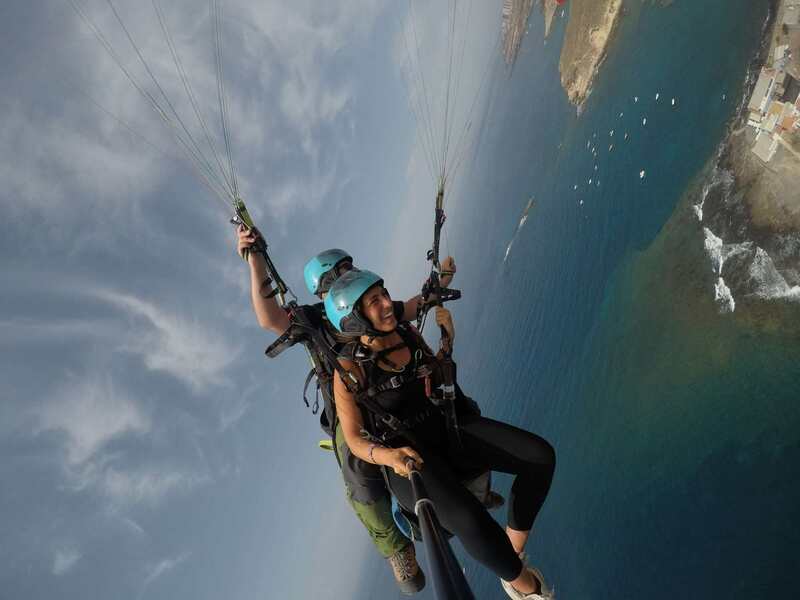 We will give you a helmet and a harness for your tandem paragliding experience in Tenerife South. And don’t worry — the equipment is included in the price. Fly through Tenerife South sky enjoying the most breath-taking landscape and views. The years of experience of our paraglider pilots will make you live an unforgettable experience. All our tandem paragliding flights in Tenerife South give you the chance to fly over the best places in Tenerife. Just take a look at our services and choose the one you like the most. We want to offer you the chance to witness the incomparable beauty of the island and its many astonishing views, like Barranco del Infierno in the south of Tenerife and many other places. If you are worried about safety, don’t do it. This sport requires an experienced instructor to take the controls of the advance paraglider — that is the reason why our professional pilots are just the best professionals and they have many years of flying experience on the island.